Bank Holiday bargains from Sevenoaks Sound & Vision | What Hi-Fi? It's not just Best Buy that's rolling out the discounts this Bank Holiday weekend. We've just been given an exclusive preview of the hot deals that will be available from Sevenoaks Sound & Vision from Thursday, August 25th until September 3rd. 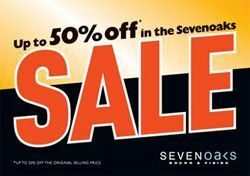 To view more sale offers, visit the Sevenoaks website.